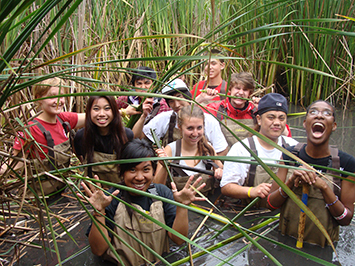 Linking Individuals to their Natural Communities (LINC) is a six-week summer internship program in which high school students assist with service projects, gain career and leadership skills, take field trips to special park sites, and learn about ecology and science. There is no experience necessary to apply—just a desire for adventure, being part of a team, and trying new things! All students receive an educational award of $1,000 upon completion of the program. Applications are due Friday, March 20 by 5 pm. Download the application or view the flyer. 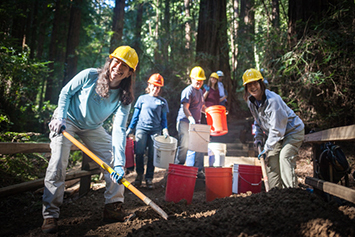 Interested members of the public are invited to join California State Parks and the National Park Service at a project open house on March 18 and trail walk on March 21 to discuss concepts for two trail projects within the Redwood Creek Watershed. 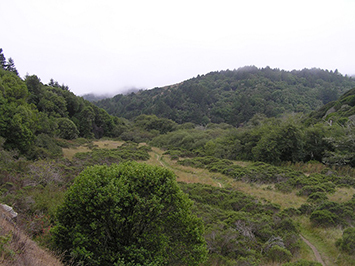 These projects include improvements to the existing Redwood Creek Trail and extending the Dias Ridge Trail along a segment of Highway One to connect to the Redwood Creek Trail. You can learn more about these events here. On January 31, 239 enthusiastic volunteers joined 57 staff and interns across the mountain for the Hands On Tam Winter Work Day. Together, we planted native plants, pulled invasive weeds, and maintained our spectacular trails. Check out highlights of what we accomplished as well as photos from the day. The next volunteer day will be on April 25. A partnership of One Tam and the Friends of Mt. Tam, Mt. Tam Earth Day will offer an opportunity to care for our trails, maintain the historic Mountain Theater, and remove invasive plants that threaten the mountain's rich biodiversity. Stay for lunch and a wildflower walk, and come back after sunset for the Friends of Mt. Tam's first astronomy program of the year. Learn more and register here. The Friends of Mt. Tam (formerly Mt. Tamalpais Interpretive Association) is celebrating 30 years of supporting visitor services and programs on the mountain. Learn more about their fun and engaging weekend interpretive walks, monthly Astronomy Nights, and other programs on their calendar. 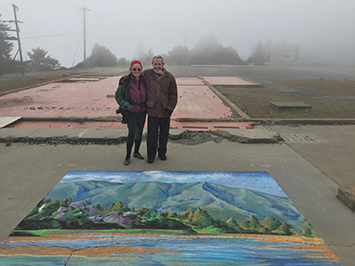 Filmmaker Gary Yost has partnered with artist Genna Panzarella on a new project that uses chalk and the cement pads left by the military to capture the West Peak of Mt. Tam as it once was. According to Gary, “I have spent many years exploring Mt. Tamalpais; listening to its singing both in my dreams and waking life. My films about the mountain have always been an attempt at visualizing her songs, and now with this film anyone can have a direct experience of the ephemeral nature of being in just 8 minutes. Our film is proof that the synergy of creative collaboration can result in magic beyond our imagining. It is the misty mystery of impermanence.” Check out the video here: https://vimeo.com/119016971. 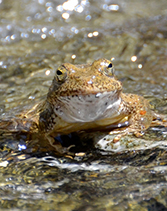 The foothill yellow-legged frog, Rana boylii, is native to parts of Mt. Tam. This species has disappeared from more than 45% of its historic range in Oregon and California, and because its population is declining it is listed as both a federal and state species of special concern.